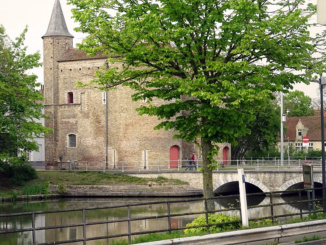 Today we came into the port of Zeebrugge, Belguim to begin the last tour of our European Capital’s cruise. 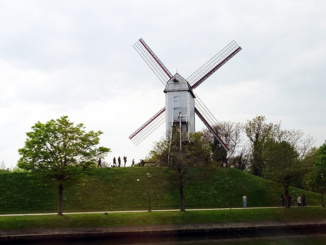 Dutch is the first language spoken in this region but French and German are also considered languages of Belgium as well. 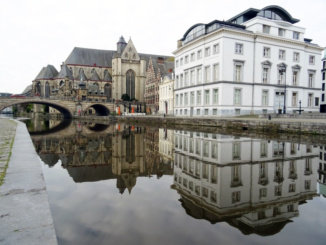 As a matter of fact, 75% of the population in the Belgium capital of Brussels speak French and refuse to speak the local language. 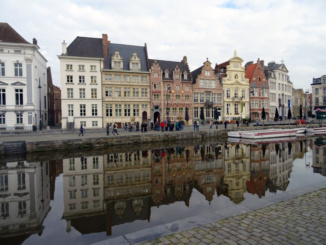 Before 1815, Belgium was not even known as a country. These lands were created to prevent another occupation by someone like Napoleon. Later in 1918, the harbor area was attacked by the British so a new harbor was constructed 1-1/2 miles further out into the sea. 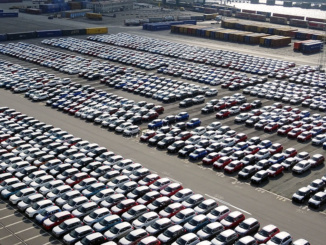 Since those times, Zeebrugge has become the busiest port in the world for car shipping. 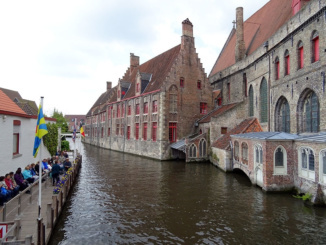 We boarded a standard bus at the port and took a one hour drive to the quaint town of Ghent. It was a very quiet town but there were interesting things to see, and a great deal of history to learn. 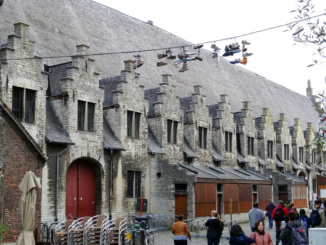 Ghent became an important town due to their production of cloth, traced to the roots of imported English wool. Our walking tour of the town began at 8:30am. 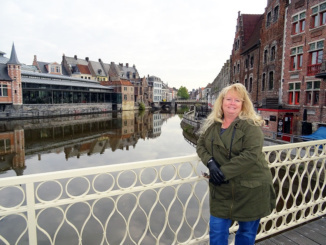 We walked about the town and canals and saw the site of the 1913 World’s Fair while admiring the Gothic architecture of the city. 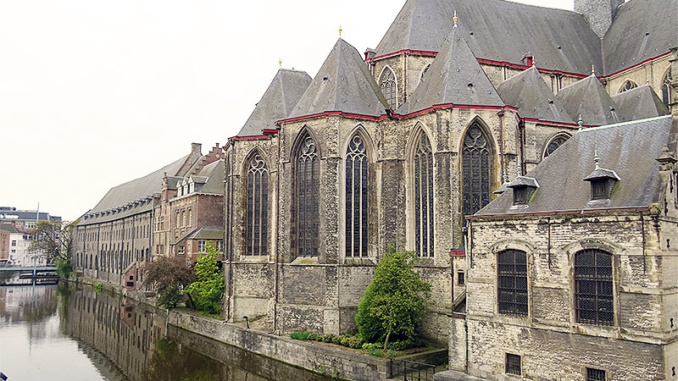 Our walk ended at St. Bravo’s Cathedral the Church that houses the famous panels of the 1432 Van Eyck painting known as the Ghent Altarpiece, considered a masterpiece of European art. 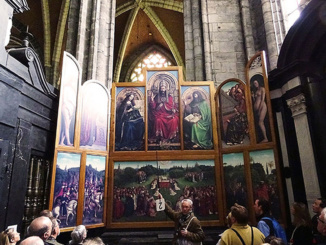 We first viewed the reproduction panels and learned that the artwork is considered one of the most important paintings in art history and then we were able to view the actual panels. The Just Judges panel of this famous artwork is a reproduction as the original was stolen in 1934 and remains missing to this day. During WWII the Nazi’s confiscated the panels and stored them in a salt mine until their eventual rescue. 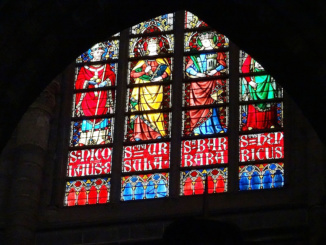 This led to the eventual creation of the reproduction panels. 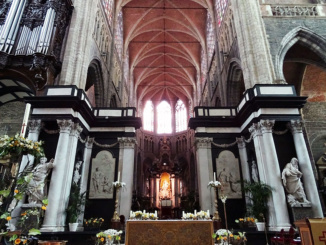 At 10:15am, after a lengthy visit and tour of St. Bravo’s Cathedral we were back on the bus headed for Brugges. 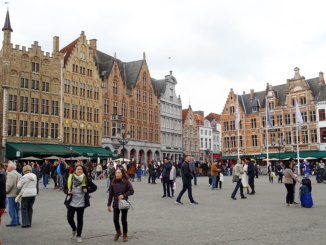 It took about an hour to reach the medieval city of Brugges, arriving at 11:10am. 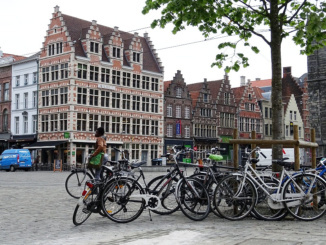 Brugges has been a city since its charter in 1128. 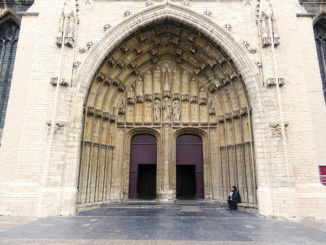 This area became important due to the tidal inlet that permitted the flow of commerce into the area. The inlet was thus coined The Golden Inlet. 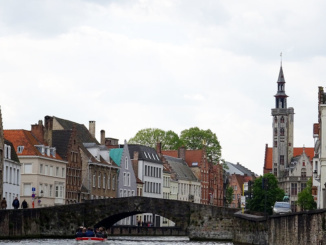 6,000 bombs fell on Brugges during WWI with only one landing in the historic city center. 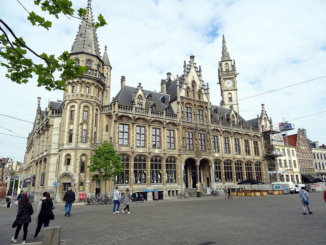 During WWII, the Germans wanted the town of Brugges destroyed but the Commander in charge refused to follow those orders. He would later be honored for the decision that saved the city. 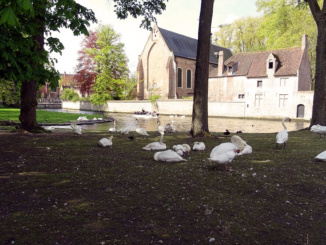 We walked from the bus park through the town to the area of the swans. This was a pretty extensive walk and we were glad that we were wearing our walking shoes. 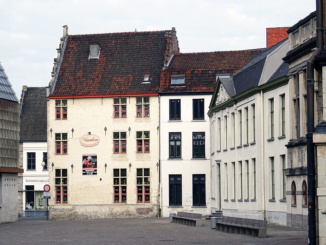 Adjacent to the area holding the swans was the Maximiliaan van Oostenrijk Restaurant. 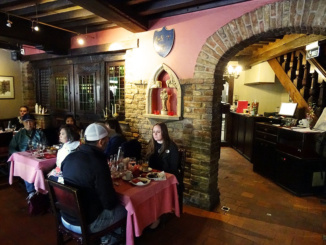 Here we had a great lunch consisting of tuna salad, chicken with mushrooms, fries, chocolate mousse, and beverage of our choice. Our lunch ended at precisely 12:40pm. 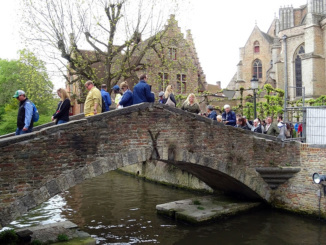 After lunch we began an in-depth walk of Brugges. 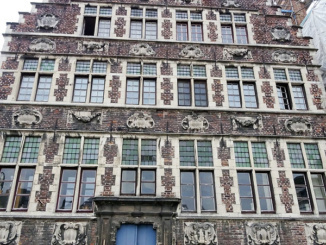 We crossed canals and admired the facades and exteriors of the ancient city. 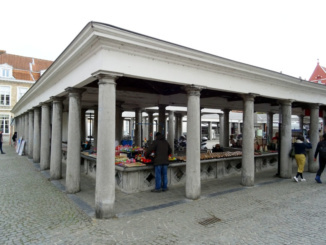 We passed many old churches and the fish market and ended in the main city square. 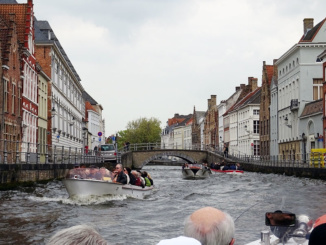 Next we headed off to Bootexcursies Groothouse where we took a 30 minute canal tour. The tour was very scenic although the guide was more a comedian than a historian. Still it was a good break in the action and a nice getaway from the multitudes and multitudes of people who had descended on Brugges this day. After our canal ride we were given about one hour of free time. 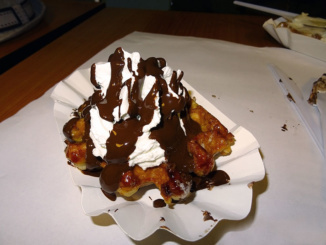 We located a café where we purchased a Belgium Waffle then we wondered across the street to a Chocolatier and purchased some handmade chocolates to bring back to the ship. Delicious! 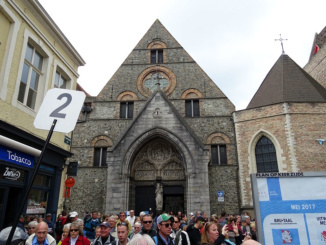 We had wanted to visit the Madonna of Brugges statue by Michelangelo at the Church of Our Lady but there were simply too many people in the queue. 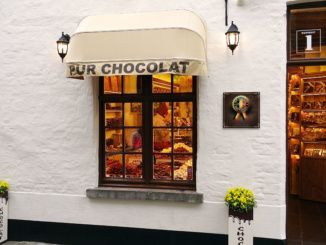 We opted for a little shopping to pick up some souvenirs from our day in Brugges. After meeting up with our tour group, we were escorted back to the coach parking lot located on the far side of town. The walk took approximately twenty minutes arriving at the coach at 4:05pm and we were on our way back to the ship.